Pavtube ByteCopy is an ideal tool for you to backup Blu-ray Disc to MKV file for playback on PC and HD media players. The software pays special attention to lossless video and audio output. It lets you pass through and package HD audio with video and subtitle streams so that high quality audio track encoded with TrueHD, DTS-MA, LPCM, Dolby Digital 5.1, DTS 5.1 can be retained without quality loss. As to video and subtitle steams, you can either choose lossless pass-through or re-compression. The following short guide tells you how to backup Blu-ray Disc to MKV file format in a lossless way with TrueHD and DTS-MA audio passed through using Pavtube ByteCopy software. The software is easy of use. You just load movie from source Blu-ray Disc, click the convert button and wait. Download a trial of Pavtube ByteCopy and follow the short guide below to make lossless Blu-ray Disc to MKV backup and pass through audio to enable direct transfer of the audio track. Step 1. Run Pavtube ByteCopy, and click “Load Disc” button to import movie files from copy-protected Blu-ray Disc/DVD. Step 2. Once the movie source is opened you will see its contents as a tree structure. Normally, disc contains titles- individual clips such as main movie and bonus features. For each Title you can click the plus sign to view detailed information such as video codec, size, audio codec, language, subtitles and so on. You can select which titles you want to save and what tracks to keep in each title. Uncheck the audios and subtitles you don’t like, and the others will be reserved. 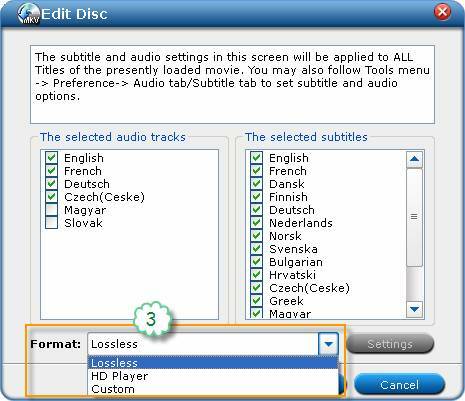 More than one audio streams can be included in final file. Step 3. Click on the disc label (normally the movie name) to select the whole movie. When the movie is selected, “Edit Disc” button will be highlighted. Click the button, and set “lossless” from drop-down list of “Format” box. Step 4. Back to the main interface, and click the “Convert” button to start backing up Blu-ray movie to MKV files. Selected audio tracks will be passed-through and sealed into MKV file with video streams and subtitles. A pass through keeps the original Dolby/DTS tracks in original encodes, so TrueHD, DTS-MA, LPCM, Dolby Digital 5.1, DTS 5.1 audios are maintained. By now you have ripped Blu-ray movie into MKV file and passed original video and audio quality through into a file playable on a typical hard disk media player. 1. The Pavtube ByteCopy rips BD/DVD as fast as your BD drive can read data when lossless output is selected. It takes 1hr to 2 hrs to rip BD based on the file size of source Blu-ray movie (normally 20GB- 50GB). 2. If you would love to change TrueHD, DTS-MA 7.1 audio to AC3, AAC or DTS 5.1 sound, click “Edit stream” button to set audio codec and channels.